동화사는 신라시대에 지어진 후 8차례에 걸쳐서 새로 지었으며, 대웅전 또한 여러 차례 다시 지은 것이다. 지금 있는 대웅전은 조선 후기인 영조 3년(1727)에서 영조 8년(1732)에 지은 것으로 추정한다. 대웅전은 이 절의 중심 건물로 앞면 3칸·옆면 3칸 규모이며 지붕은 옆면에서 볼 때 여덟 팔(八)자 모양을 한 팔작지붕이다. 지붕 처마를 받치기 위해 장식하여 만든 공포는 기둥 위와 기둥 사이에도 있는 다포 양식이다. 문짝은 여러 가지 색으로 새긴 꽃잎을 장식해 놓은 소슬꽃살창을 달았다. 또한 기둥은 다듬지 않은 나무를 그대로 사용해서 건물의 안정감과 자연미를 나타내고 있다. 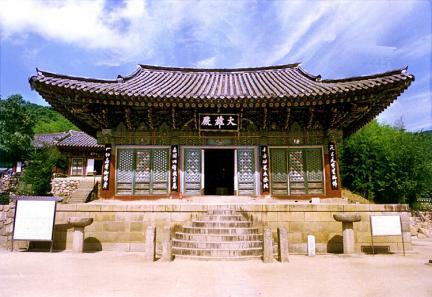 Since its founding during the Silla Period, Donghwasa Temple has undergone overall reconstruction eight times and its Daeungjeon Hall has also been rebuilt several times. 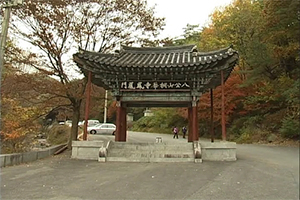 The present structure is assumed to have been built between 1727 and 1732, during the reign of King Yeongjo (r. 1724-1776) of the Joseon Dynasty. 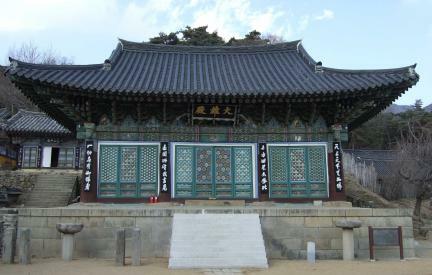 Daeungjeon, measuring three kan (a unit of measurement referring to the distance between two columns) at the front and three kan at the side, has a hipped-and-gabled roof over multi-bracket sets. The lattice doors are elaborately decorated with raised floral carvings in diverse colors. The columns made of undressed timber contribute to the natural beauty of the structure.